Commandant National Defence College, Vice Admiral Sunil Lanba, AVSM, members of the faculty and staff, officers from the Indian Armed Forces, Civil Services and from friendly foreign countries. 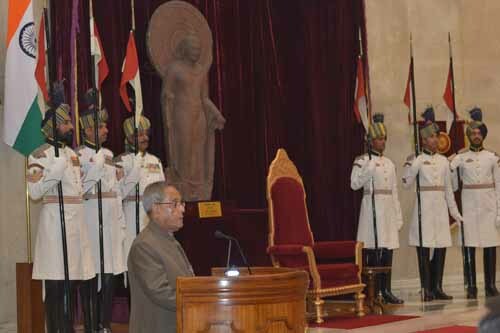 It gives me immense pleasure to welcome you all to Rashtrapati Bhavan. The global environment today poses numerous challenges to the world leaders and policy makers because of its dynamic nature. Astonishing pace at which the events have unfolded in the recent past could not have been foreseen even a decade earlier. Each country is guided in its actions by its national interests and objectives. The power relationships are constantly changing, and unless a country understands and adjusts itself to the changes that are taking place around it, its own security will be seriously endangered. Since natural and man made resources are always at a premium, there will be intense competition among the nations to take control of these resources. Security today has many dimensions as it encompasses economic, energy, food, health, environmental and many other dimensions of security. Intensive research and quality analysis in all the fields and disciplines is thus a pre requisite which calls for a holistic approach to studies across the vast spectrum of disciplines. There must be a conscious effort to strengthen the underlying linkages and not divide them into watertight compartments. Adopting such an approach will yield rich dividends. At the same time, one must not lose sight of the larger picture and keep the primary objective of the research always in focus. The success of any nation state depends on how effectively it harnesses all the available resources at its disposal, foremost among these being the human resource. The development of human resource for National Security is an onerous task undertaken by your Institute, National Defence College of India where senior officers from not only armed forces but also from civil services and friendly foreign countries are endowed with the background knowledge to make policy decisions related to national security. In a democratic system like ours, various organs of the state must understand the strengths and limitations of each other. Political leadership and senior Civil Services officers must be conversant with the capabilities and limitations of the defence forces. Similarly, Armed Forces officers need to understand the limitations and constitutional frame work under which political setup and Civil Services function. However, both of them should be aware of larger perspective of National Security in order to take informed decision of vital importance. I understand that a total of six studies comprise the curriculum of the National Defence College course. The Socio-Political Study is to make you comprehend the main features of the Indian society and polity and to assess issues which have a bearing on National Security. The Economy, Science and Technology Study is to introduce you to the principles and practices that shape economic trends as well as influence of science and technology in attaining self reliance in security related fields. Similarly Study on International Security Environment, Global Issues and India’s Strategic Neighborhood is to focus on the international security environment as also its impact on India’s foreign policy. The final study on Strategies and Structures for National Security is the synthesis and culmination of everything that has been learned and experienced during the year. The role of the armed forces has also expanded far beyond traditional military matters with the revolution in military affairs and globalisation. It is clear that future conflicts in the complex defence and security environment will require a more integrated multi-state and multi-agency approach. Preparing military leaders, police officers and civil servants to deal with complex security environment of the future will necessarily have to be addressed in a holistic, integrated and comprehensive manner. I once again wish you, all success in your future endeavours and hope that you all will bring more laurels to National Defence College and the Country.